1 Assessing the Employment Implications of the 2006 Repeal of the Public Utility Holding Company Act (PUHCA) Presented by: Jim Voye Director of Research. 2 22 2 PUHCA – Background Federal consumer protection law passed in 1935. Regulated parent or holding companies of electric and natural gas utilities so that rates could not be raised by charging high fees to utilities for services from affiliates. Parent or holding companies could not speculate in riskier businesses with ratepayers money – such speculation harms utilities credit and raises their cost of borrowing money, thereby, raising customers utility bills. 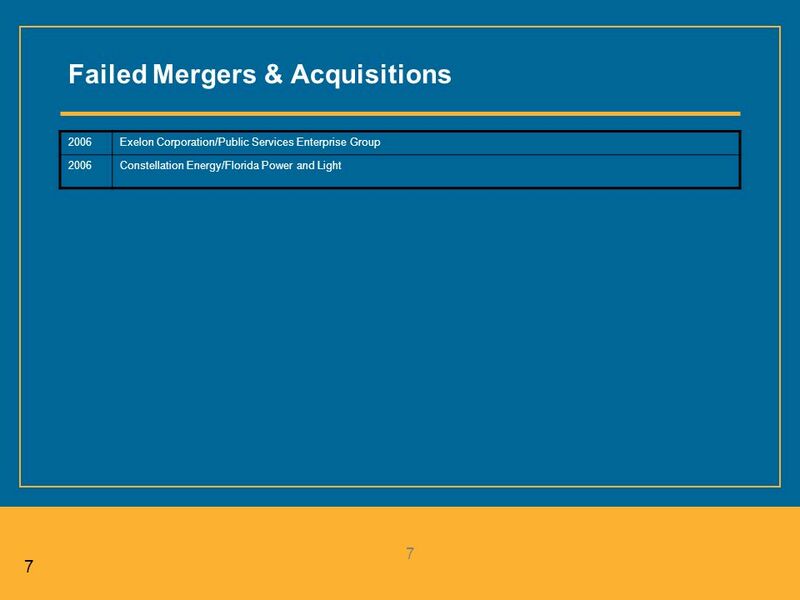 Utility parent companies required to incorporate in the same state where the utility operates so state can regulate them, or to be regulated by the Securities and Exchange Commission (SEC) if they operate in several states. Non-utilities, such as oil companies or investment banks, not allowed to own utilities. 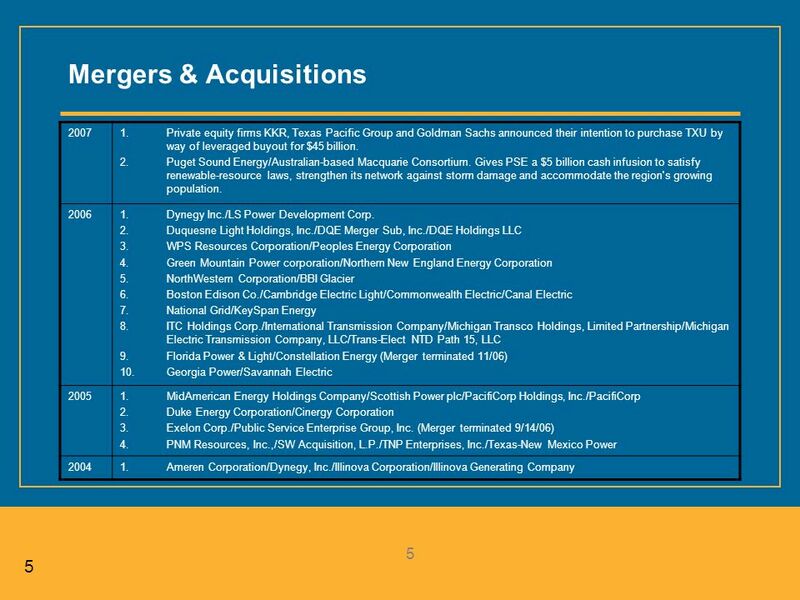 SEC to approve any merger or utility acquisition by a holding company to prevent the reappearance of the huge electric and natural gas cartels of the 1920s that abused their customers and went bankrupt in large numbers because of Enron-like speculation and accounting scams. 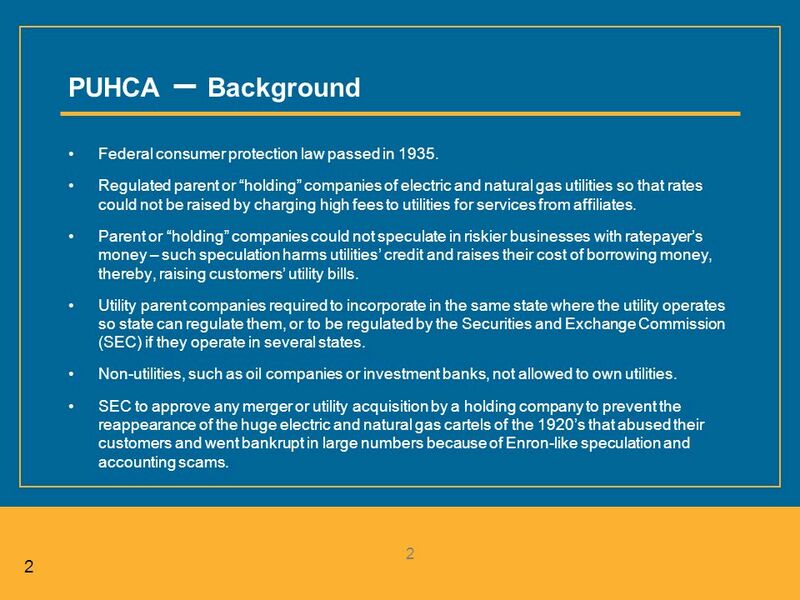 3 33 3 PUHCA – Background Utility industry and would-be owners of utilities lobbied Congress heavily to repeal PUHCA, claiming it was outdated. 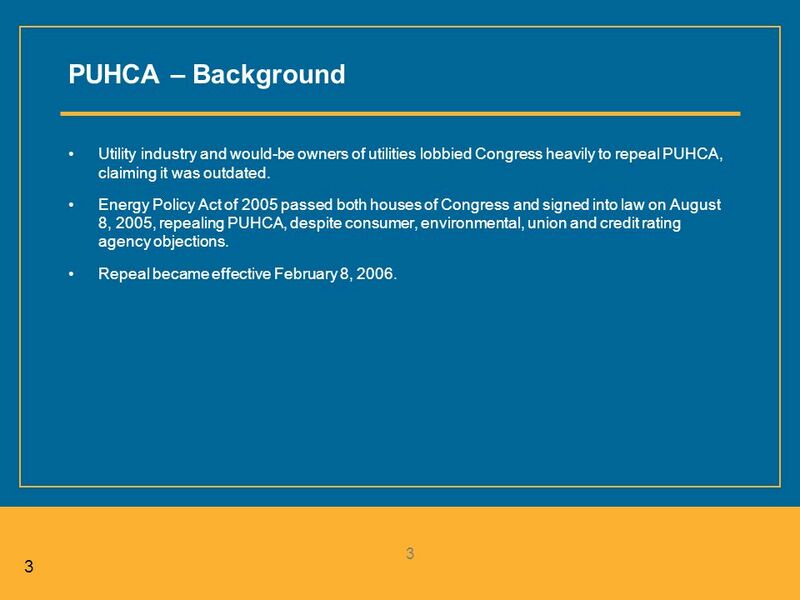 Energy Policy Act of 2005 passed both houses of Congress and signed into law on August 8, 2005, repealing PUHCA, despite consumer, environmental, union and credit rating agency objections. Repeal became effective February 8, 2006. 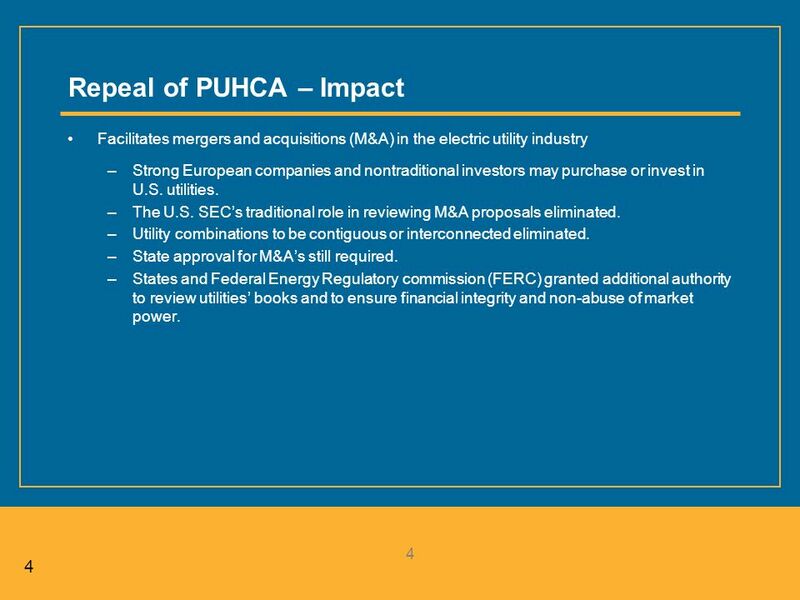 4 44 4 Repeal of PUHCA – Impact Facilitates mergers and acquisitions (M&A) in the electric utility industry –Strong European companies and nontraditional investors may purchase or invest in U.S. utilities. –The U.S. SECs traditional role in reviewing M&A proposals eliminated. 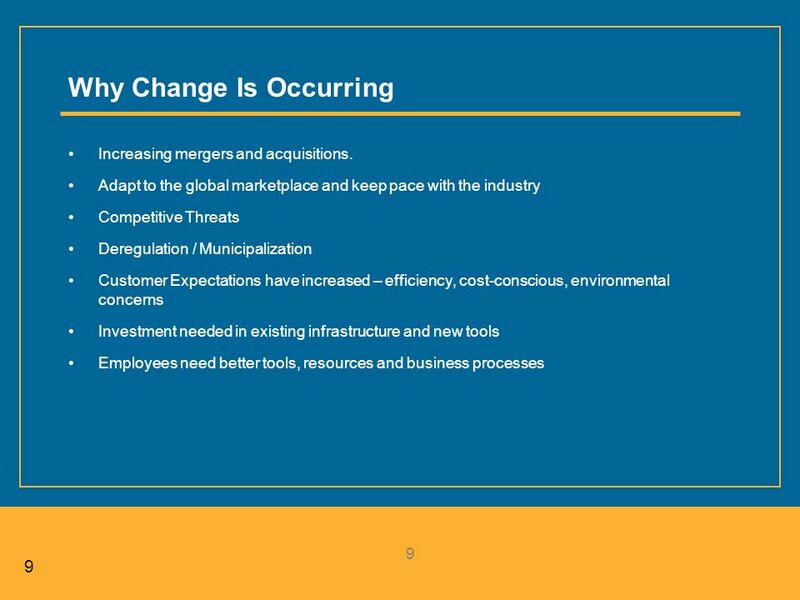 –Utility combinations to be contiguous or interconnected eliminated. –State approval for M&As still required. –States and Federal Energy Regulatory commission (FERC) granted additional authority to review utilities books and to ensure financial integrity and non-abuse of market power. 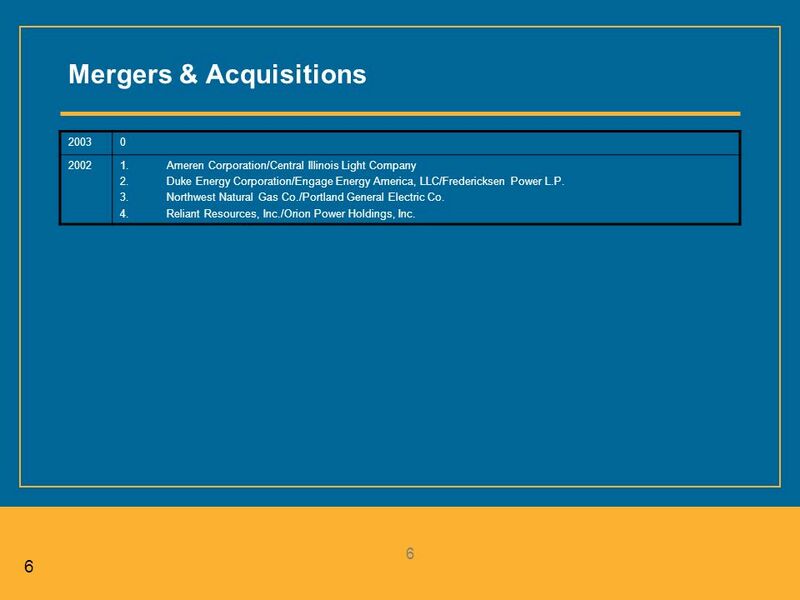 6 66 6 Mergers & Acquisitions 20030 20021.Ameren Corporation/Central Illinois Light Company 2.Duke Energy Corporation/Engage Energy America, LLC/Fredericksen Power L.P. 3.Northwest Natural Gas Co./Portland General Electric Co. 4.Reliant Resources, Inc./Orion Power Holdings, Inc.
11 11 Survey – Questions 1.Does your company currently have any business initiatives to address competition in the utility industry? 2.If yes, please describe the initiative. 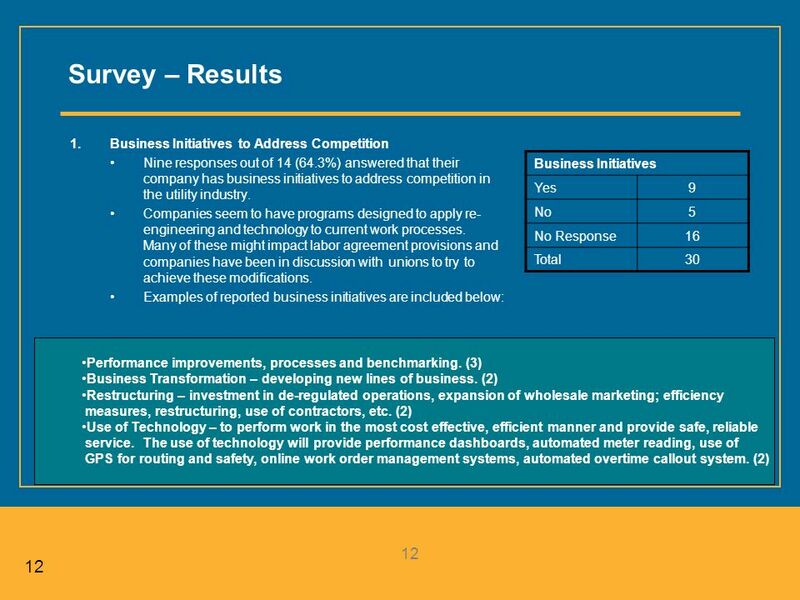 3.How long has your company been working on these initiatives? 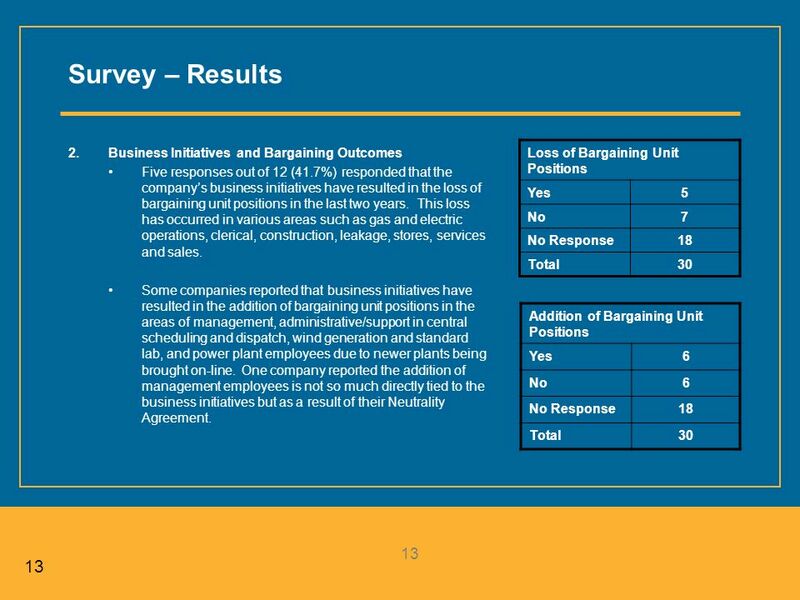 4.Have your business initiatives resulted in the loss of any bargaining unit positions in the past two years? If so, how many? In what areas? 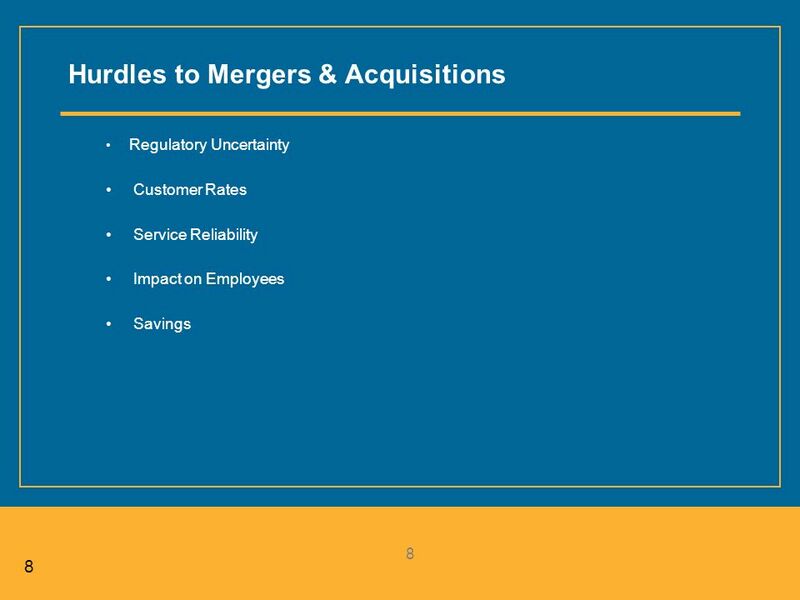 5.Have your business initiatives resulted in the addition of any bargaining unit positions? If so, how many? In what areas? 6.Are your unions supportive of your business initiatives? Why? 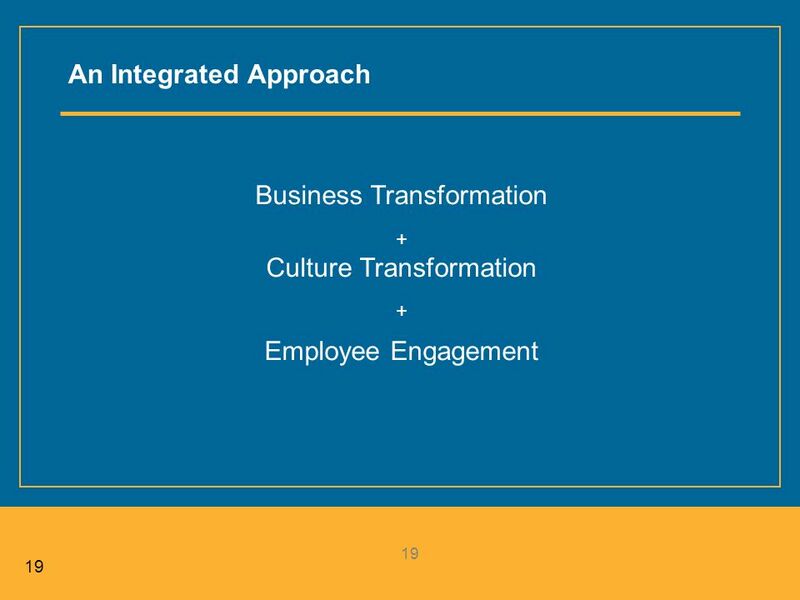 7.Are your employees supportive of your business initiatives? Why? 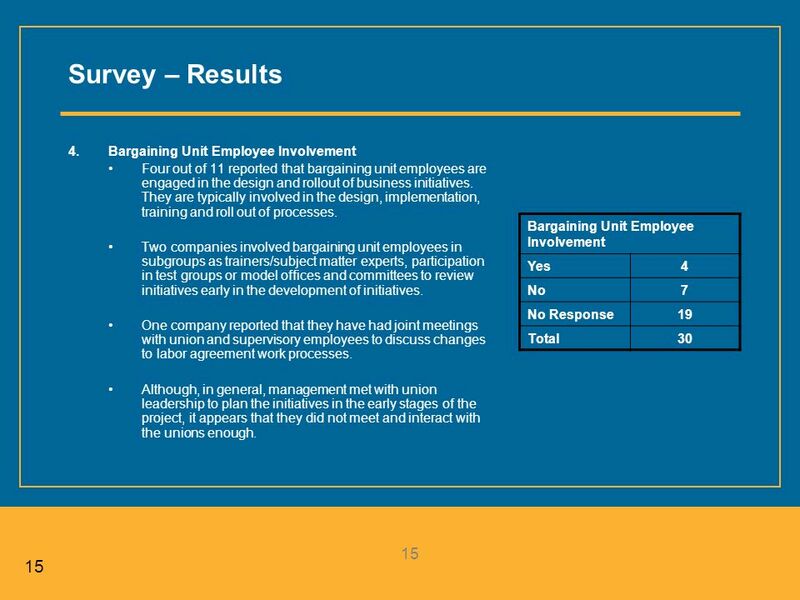 8.Are bargaining unit employees involved/engaged in the design and roll out of business initiatives? How? 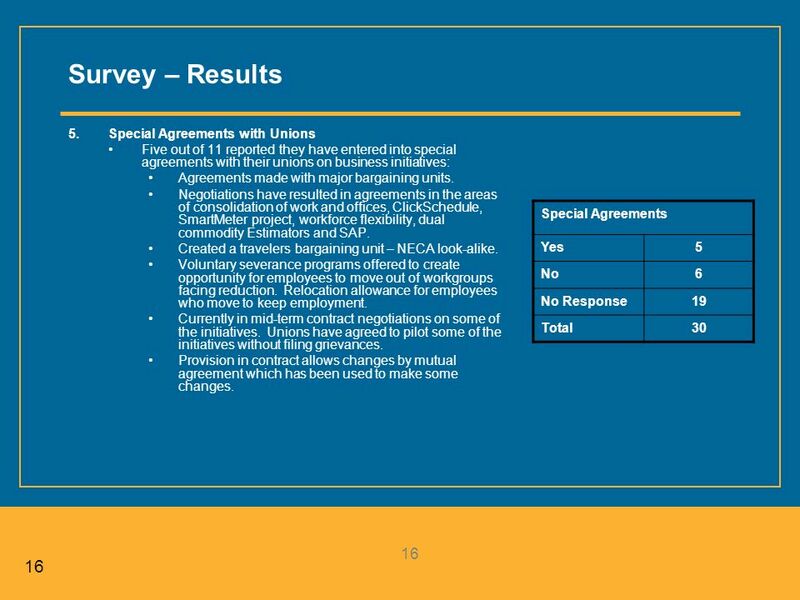 9.Have you entered into any special agreements with your unions on business initiatives? Please explain. 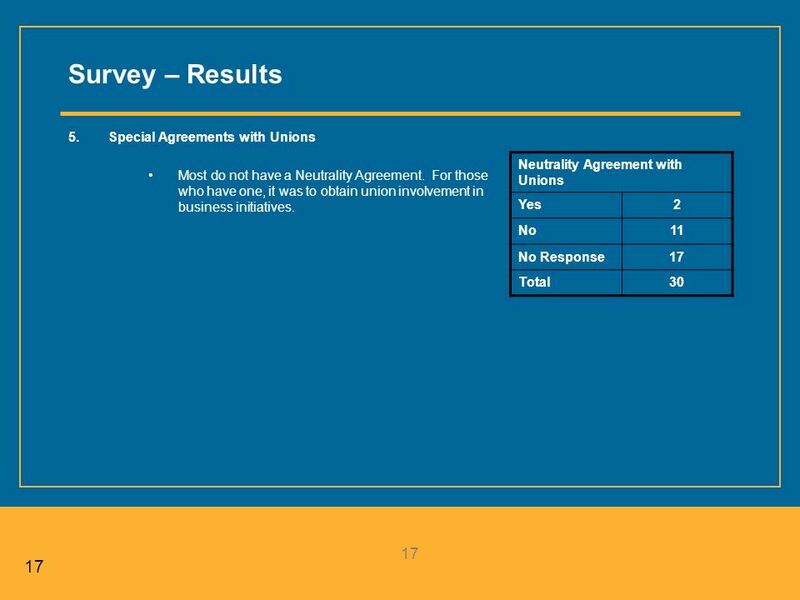 10.Do you have a Neutrality Agreement with your unions? 11.If yes, why did you enter into a Neutrality Agreement? 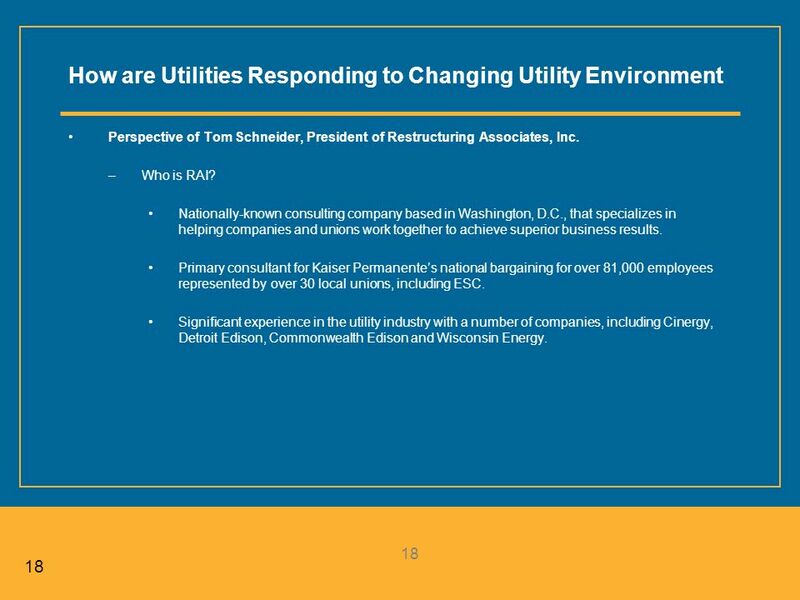 18 18 How are Utilities Responding to Changing Utility Environment Perspective of Tom Schneider, President of Restructuring Associates, Inc. –Who is RAI? Nationally-known consulting company based in Washington, D.C., that specializes in helping companies and unions work together to achieve superior business results. Primary consultant for Kaiser Permanentes national bargaining for over 81,000 employees represented by over 30 local unions, including ESC. Significant experience in the utility industry with a number of companies, including Cinergy, Detroit Edison, Commonwealth Edison and Wisconsin Energy. 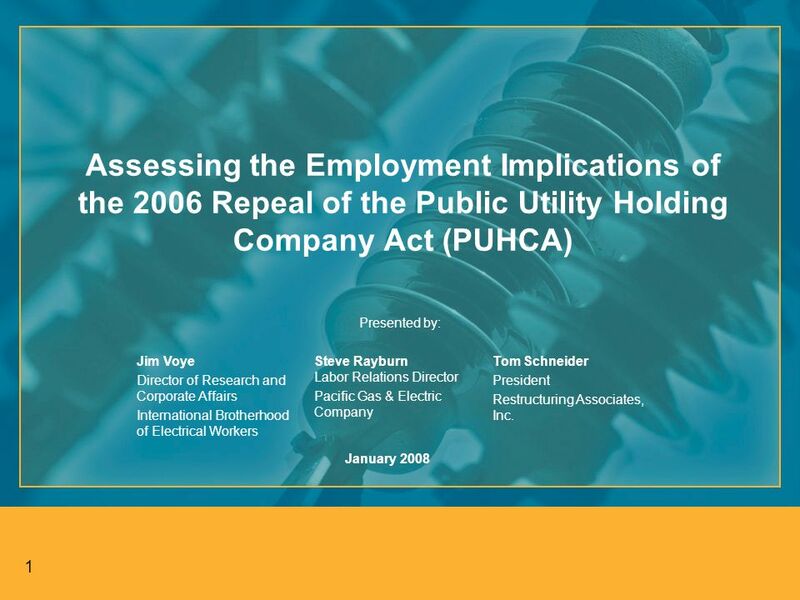 Download ppt "1 Assessing the Employment Implications of the 2006 Repeal of the Public Utility Holding Company Act (PUHCA) Presented by: Jim Voye Director of Research." 1 The Changing Fortunes of the EUs Energy Market Antony Froggatt. Smart Grid: an Ontario Perspective Brian Hewson, Senior Manager Regulatory Policy Hamilton May 8, 2013. February 18, Breakthroughs in Healthcare Workforce Development Transforming Public/Private Partnerships. ©2005 PJM 1 Development of Wholesale Electricity Scheduling and OASIS Determining the Future Needs of the Open Access Same-time Information System Andy. Presentation to the Western Electricity Coordinating Council Board of Directors Seattle, WA by Jeff Burks and Bill Westerfield April 21, 2004 Western Renewable. Presentation to the Joint Review Panel Yellowknife General Hearing December 5 th, 2006 Dennis Bevington MP Western Arctic. CORPORATE COLLEGE AND REGIONAL COLLABORATION: RE-TOOLING THE WORKFORCE SEMCOG University Tuesday, July 27, Presented by Dr. George Swan III.